Let me help you look your most beautiful on this very special day of your life. Usually I will see the bride for her first consultation near the end of her event planning. So things like the dress, the venue, flowers and general ‘theme’ for the day are all decided. This is a great start as it helps me to understand the look you want to achieve. I always say that a bride should feel like herself on the day, only the most polished and elegant version. I'm often asked what the process is for booking my services for your big day. The first step is to secure your Wedding date in my diary as I will only ever do one bridal party on any given day, so once I have your booking I won't be available for any other requests. Your Wedding date will only be secured once you have paid your deposit. Please take a look at my Bridal Prices section for further details. Secondly, about 1-3 months before your Wedding Day we will carry out a consultation and trial which will last between 1.5 to 2 hours. We will discuss your dress, hair, colour scheme and explore ideas on the look you want to achieve. We'll then experiment until we achieve your perfect Wedding Day look. I will make a record of all the products I use on your personal face chart, along with a photo of your final look, so that on the day I can recreate exactly the look you want. If any other members of your Bridal party would also like a trial at the same time, then obviously I'm happy to arrange this. At this stage, we will discuss and agree timings on your big day to ensure make up and hair are all completed in good time. Finally, the big day has arrived! I will arrive with everything I need to ensure you, your Bridesmaids and mum are all looking picture perfect in plenty of time. If you're looking for a vintage themed wedding, then I can create the makeup and hair to suit the era, whether that's jazz, ballroom or rock n roll inspired. When we have our first consultation, the style of your dress will be a big influence on which way the hair and makeup will go. Is the dress boho, classic and sleek, or fairy tale? The look should be a complete one, as a classic french pleat might not suit a floaty dress for getting married on the beach….just as the cut and detail are key. A high necked beaded number might not work well with tumbling curls for instance, so have an idea of what you want and like but this is also the time for us to discuss and experiment... and hopefully have some fun whilst doing it! 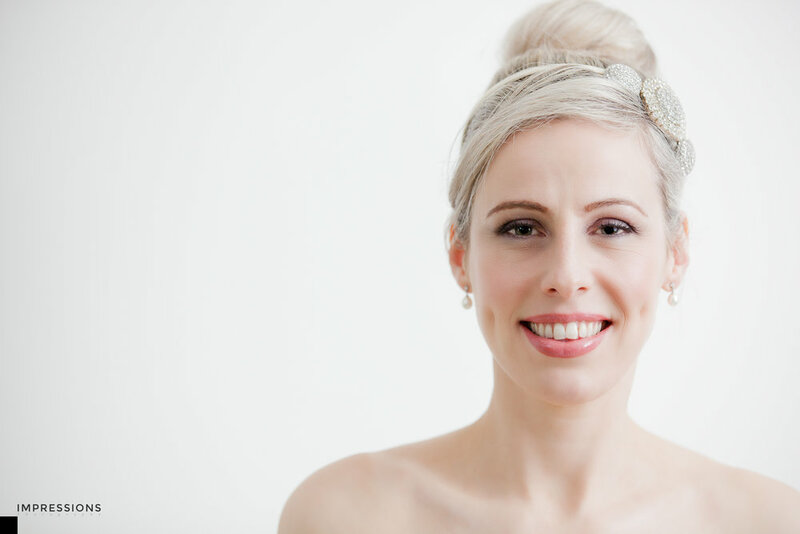 Using my experience to select the best products to use on your skin, I can create that glowing, dewy look most brides want from their wedding makeup.